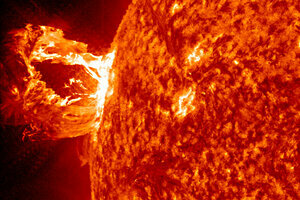 Daredevil Kreutz comets fly close to the sun, leading to hundreds of solar suicides. Between Wednesday and Thursday this week, astronomers at NASA’s Solar and Heliospheric Observatory (SOHO) noticed something special – a comet in close proximity to the sun. Astronomers watched the comet plunged towards the sun, where it was rapidly devoured by solar forces. Comet suicides aren’t necessarily the result of a direct impact with the sun, but typically occur when a comet passes too close to the sun to withstand the sun’s gravitational forces and heat, and disintegrates. The comet, first noticed by SOHO on August 1, was speeding at approximately 1.3 million miles per hour as it plummeted towards the sun, according to Dr. Frazier. It was part of the Kreutz comets, a group of comets with similar 800 year orbits, all of which broke off from a larger comet hundreds of years ago. Scientists believe that the original comet may have produced as many as 20,000 fragments. The comet fragments were named after German astronomer Heinrich Kreutz, who first theorized that the pieces were originally part of the same comet. Other Kreutz comets have met a similar fate, enough that these diving comets have a special name. Astronomers call them “Kreutz sungrazers” for the way they touch the sun. Most are never noticed, but some, like this week’s, make a splash. Astronomers were enthusiastic about the event. August 7, 2016 mannaismayaadventureSpectacular comet suicide: Does that happen often?